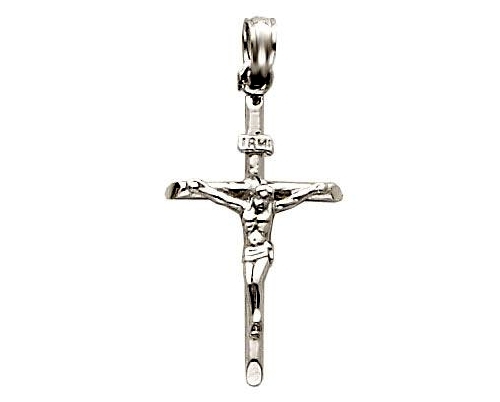 White gold crucifixes are used in a variety of religious jewelry items that is worn on both formal and informal occasions by men and women of Christian faith. Mainly, white gold crucifixes are used in pendants, necklaces, and finger rings. The main advantage of using white gold crucifix jewelry is that it is more resistant to wear than yellow gold and hence lasts longer. Jewelry containing white gold crucifixes is also bought as gift for family and/or friends of Christian faith. The variety of designs, both plain and ornate, makes white gold religious jewelry popular among jewelry enthusiasts of both genders who like to present themselves as people of faith. White gold is actually an alloy of yellow gold with one or more metals, particularly nickel or palladium. The purpose of making white gold is to make gold harder and more resistant to wearing so as to create jewelry pieces that may last longer. White gold crucifixes have been in use in religious jewelry for quite some time. They are not very different in price from yellow gold crucifixes of the same purity and size but are likely to last longer and they offer a wide variety of items in which they can be used as symbols of faith while keeping the user’s flair of fashion. Jewelry containing white gold crucifixes is worn on both informal and ceremonial occasions. It is also used as a gift for family and/or friends. White gold crucifix pendants serve two main purposes: you can wear them as necklaces in summer when the neck and bust are not tightly covered; and they can be clipped to the dress in winter to adorn its look and present oneself as a person of faith. More than one white gold crucifix can be worn on the dress to heighten the fashionable effect of display. It is recommended in such a case to use simple or moderately ornate designs so as to avoid appearing gaudy. Some white gold crucifixes are specially designed in such a way that the ends of the cross appear pointed as arrows. These crucifixes are best matches for use with platinum or silver jewelry with elongate outlines and/or pointed ends. Some people would prefer to use crucifixes that combine yellow and white gold, the corpus usually made of white gold. While plain white gold crucifixes have their charm, those with precious and semi-precious stones impart a more delicate feel of aesthetic taste. For ladies of Christian faith, necklaces of white gold crucifixes with cultured lake pearls make a great choice to go with a white out fit for a matching look or with a dark colored dress for contrast. A pearl in the center of the cross with one on each side of the chain makes a sparkling combination for ceremonial use. Similarly-designed white gold crucifixes with a gemstone in the middle of the cross are very popular among both men and women, especially those who are enthusiastic about wearing a birthstone in the cross. Green peridot and blue topaz are popular gems while the more expensive diamond is always a hot favorite. White gold crucifixes are also available in the form of finger rings. Most popular among these are the two-tone crucifix rings in which the ring’s frame is made of yellow gold while the corpus is that of white gold. These rings are equally popular among men and they look impressive with many colors and shades of formal wear.